Subjects: JLs in Telugu, English, Maths, Physics, Chemistry and Zoology. 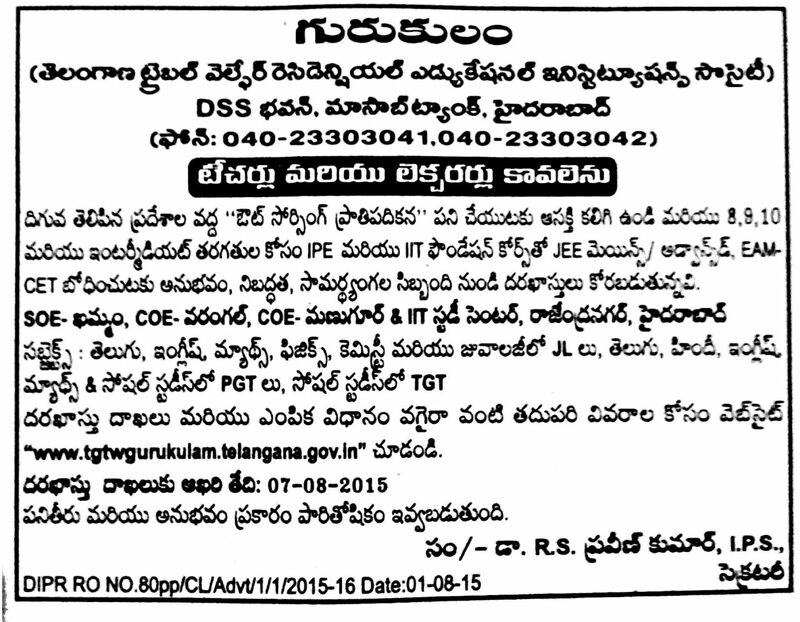 PGTs in Telugu,Hindi, English, Maths & Social studies. TGT in Social studies. Please see website “www.tgtwgurukulam.telangana.gov.in” for further details submission of application and selection procedure etc. Last Date for submission of application is 07 - 08 -2015. Remuneration commensurate with performance and experience. The above posts are purely temporary and selected candidates have to work with commitment on Out Sourcing basis for the development of ST students. Nature of work: The schools of Excellence (SOE), Colleges of Excellence (COEs) & IIT Rajendranagar have been started in the year 2005 - 06 to provide quality education to the ST Students and to prepare them to compete successfully in Competitive Examinations like JEE Mains, JEE Advanced, and EAMCET etc. The Candidates considered for JLs in SOE, COEs & IIT Rajendranagar, Hyderabad must have the capacity to handle JEE Mains, JEE Advanced, and EAMCET classes in English Medium. The PGTs considered for Schools of Excellence (SOE) have to teach IIT foundation Classes along with 8th to 10th syllabus. Selected JLs/Teachers have to stay in the campus. Qualifications: 1) JL : 1 st Class PG in Concerned Subject. 2) PGT: 1st Class PG in Concerned subject with B.Ed. 3) TGT: 1st Class Degree. The Concerned Subject should be one of optional subjects in Degree with B.Ed. Last date for submission of applications is 07- 08 -2015. Selection procedure: A Screening Test and Demo and Interview will be administered and the date of screening test & interview for the selection of JLs/PGTs will be communicated shortly. Candidates have to bring the Print out of the application with the attestation on the photograph for attending the test/ interview. Remuneration: Commensurate with experience, performance in Interview, and Demo and negotiable. Deserved candidates will be paid suitable remuneration.